Nikki Haley drives Trump's Israel policy at U.N.
UNITED NATIONS -- U.S. Ambassador to the United Nations Nikki Haley condemned Thursday the militant group that controls the Gaza Strip of exploiting Palestinians as violence there continues unabated. "Hamas has exploited and endangered the very Palestinian people it claims to represent by locating rocket launchers near schools, apartment buildings, hotels, churches and U.N. facilities," Haley said at the U.N. Security Council. 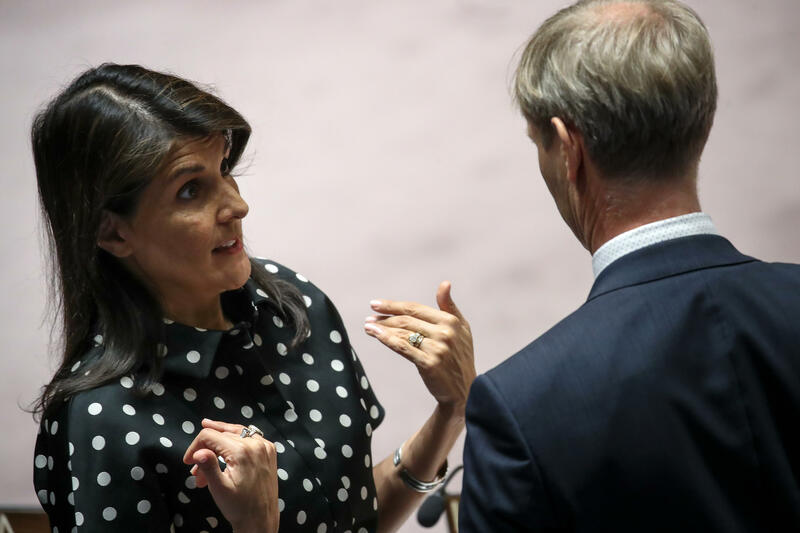 From the time Haley arrived at the U.N. last year, she has made a point of trying to turn the tide of what the Trump administration considers to be overwhelmingly anti-Israel resolutions and debate at the Security Council, at the General Assembly and at U.N. agencies. In December, the Trump administration recognized Jerusalem as the capital of Israel and announced that the U.S. Embassy would be moved there from Tel Aviv, prompting criticism at the U.N. Later that month, Haley vetoed a Security Council draft resolution that would have called for the reversal of recognizing Jerusalem as the capital. When the General Assembly passed a similar resolution, Haley organized a reception of supporters of U.S. policy. Since then, the State Department has said that the U.S. Embassy would temporarily be located at existing consular facilities in the Arnona district of Jerusalem in mid-May. Haley remains one of the few in the Trump Cabinet who is seen by Republicans and Democrats as doing a good job. A Quinnipiac University poll of American voters released Wednesday showed 63 percent approve of the job Haley is doing, including 75 percent of Republicans polled, 63 percent of independents polled and 55 percent of Democrats polled. "We appreciate the strong alliance with America and Ambassador Haley's steadfast support for the truth at the U.N.," Israel's U.N. Ambassador Danny Danon told CBS News. "President Trump made an important decision regarding the American Embassy. Jerusalem is Israel's capital, and we call on countries to follow the courageous American decision and move their embassies as well." Regarding the Gaza crisis, Danon told the Security Council on Thursday, "Israel has an obligation to protect our citizens, and we will do so while minimizing civilian casualties to the other side, but let me be clear: Israel will never apologize for defending our country." Palestinian U.N. Ambassador Riyad Mansour called for the council to work to "de-escalate" the crisis and to "speak with one voice." Haley, referring to Iran, said, "Those who want to reduce civilian casualties in the Middle East must focus their attention on the actors, including non-state actors, who intentionally keep their military infrastructure in close proximity to civilians." "It is quite simply an issue of decency," she said.